Picture of the Cutty Sark, Greenwich, London. 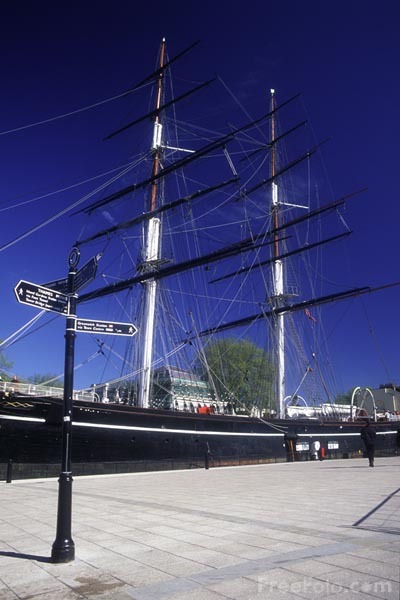 The Cutty Sark is the only surviving extreme clipper, and the only tea clipper still in existence. The Cutty Sark left London on her maiden voyage on 16 February 1870, sailing around The Cape of Good Hope to Shanghai in three-and-a-half months. On the 22 May 2007 a fire swept through the famous 19th Century ship which was undergoing a £25m restoration. After seeing the serious fire damage, Culture Minister Tessa Jowell said: "It's absolutely devastating. This is an icon, not just here in Greenwich but right around the world."